The government/UNDP agreement for the US$10.7M Amerindian land titling project came under protest yesterday by dozens of Amerindians led by the Amerindian People’s Association (APA), which says the recognition of the use of some traditional lands is still to be resolved. 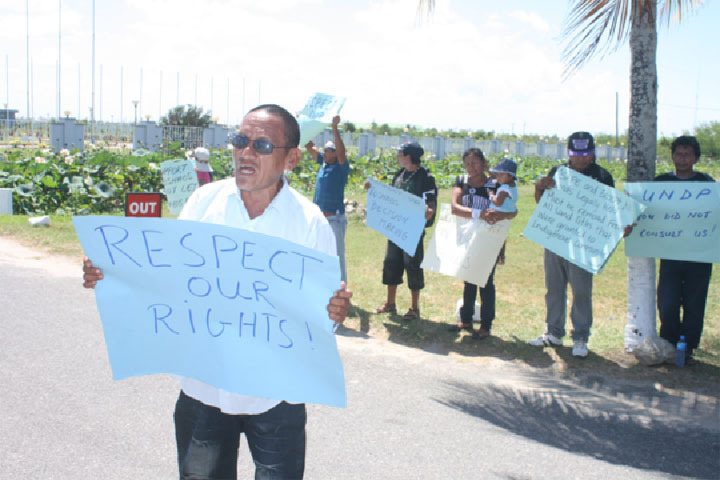 Amerindian protestors turned up at the Guyana International Conference Centre, which is the venue for the ongoing 7th annual National Toshaos Council (NTC) meeting, to protest the agreement while also lending support to toshaos seeking to have concerns adequately addressed. Protestors outside of the International Conference Centre lending support to their various toshaos. 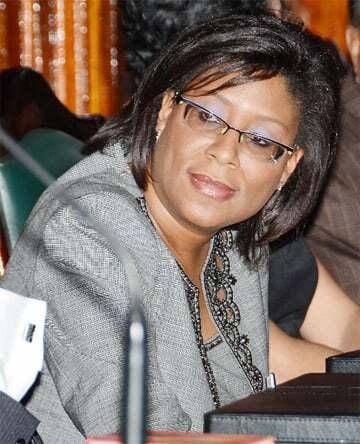 Spokeswoman for the APA Laura George told Stabroek News that many of the toshaos at the meeting were not even aware that the agreement was going to be signed on Monday. “On Monday, there was a land titling project signed between the UNDP and the Government that many of the toshaos did not know about. The UNDP did not consult with the communities and the toshaos… And that project alone, using the Amerindian Act as the legal guiding force, we have already highlighted what are the shortcomings of the Act,” she explained. At the signing of the agreement on Monday between the government and the UNDP for Amerindian land titling and demarcation, Finance Minister Ashni Singh had said that the money would be used to advance the land titling initiative that is still underway. He had revealed that to date 97 villages have been titled, while 77 others have had their lands demarcated. George expressed dissatisfaction that the UNDP signed the agreement without taking into consideration the APA’s recommendations, informed by, among other things, about concerns over the lack of recognition for lands that Amerindians have traditionally occupied. “One of the things that we have constantly said is that the Act does not recognise the lands that we have been using throughout the years. We are very disappointed that the UNDP, understanding the UN conventions, have gone ahead to sign this agreement. You have extractive sectors encroaching on our land,” she said. “A lot of our lands that have been titled do not enclose lands that we occupy and use. We will continue to speak out on all of these issues until they are adequately addressed,” she added. The protest was peaceful and George noted that they were also offering support to toshaos for them to stand up and speak out about what needs to be addressed. “We are also here not to intimidate and pressure our toshaos into endorsing agreements and programmes that we have not really understood the pros and the cons,” she said. She noted that ultimately they want the government to respect and listen to their leaders. “We want them to address our problems adequately, not to just wash it off. These are problems that are not now. It is crucial that our lands are legally recognised,” she added. 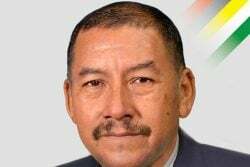 Speaking with Stabroek News yesterday, John Alfred, a former toshao of Region 9 said that the number one issue that the Amerindians are facing relates to their land and land titling. 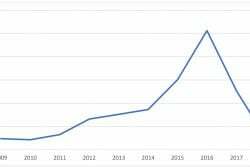 “Many of us, since 2006, have applied for land extensions but up to today nothing has happened even though there is things provided for that in the Amerindian Act. It is not being implemented. We have tried to see that these things be implemented, but nothing so far…acknowledgement letters have been going to us, but it is overdue and we are suffering,” Alfred said. “There are a lot of issues affecting us… we are glad for this conference because our communities and our members compiled a whole set of issues so that our toshaos can bring them to the conference to air them at this level and we are hoping that the outcome of this will be something that will make a difference in our communities,” he added. Alfred said that many of the villagers were dissatisfied with the many projects that were coming into their villages, and they are not getting what is theirs. “Why is it that the land problem we have is not being answered, and these different projects coming into play? These areas are being given out by the government,” he charged. Alfred added that he does not believe that the Amerindian Act is protecting the Amerindian people. “From the inception, we, as Amerindian people, have been protecting our lands and they are saying that when these systems come in to play there will be more effect on the development of so many things. We expect to see development programmes coming out of our villages, and these things are not happening,” he said. 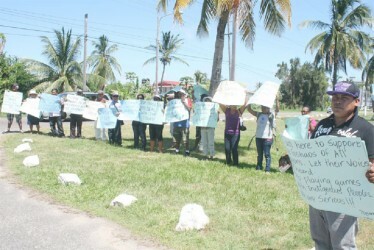 Many of the protestors said that they felt that the Amerindian Act should be amended. “We want the Amerindian Act to be amended, everything needs to be amended. If they go ahead with this land titling, we are not going to have our land extension. Let them amend the Amerindian Act so that we can have full rights to our lands,” a protestor said. “We are protesting for our land extensions and our rights and for the NTC to have their secretariat and we are here to support every one of them…we are the ones who are feeling it, not the government that is why we are not in support of UNDP. Let them give us the right to title our own lands. What they are doing is saying that our land titles are going to cost millions of dollars. Where is this money going?” Kateri Pablo, a concerned resident from Deep South of Region Nine said. Sharon Atkinson, of Santa Rosa and also of the APA, said that she was there to lend moral support to the different toshaos. “We would like to give support to those toshaos who are not strong enough to stand up. Our major issue is our land—the demarcation process, where many of our homes and farmlands are being left out of the titled area in the demarcation certificate although it is described in the 1976 Amerindian Act. We are also concerned about the substandard work of contractors in our villages and the poor educational facilities in our communities,” she said. 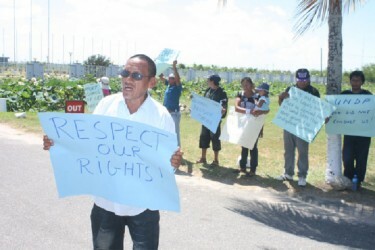 Several of the protestors also expressed disappointment that the Chairman of the National Toshaos Council Derrick John condemned their activity. “We are being told that he is embarrassed and that he is saying that he is not in support of what is going on outside here,” a protestor said. 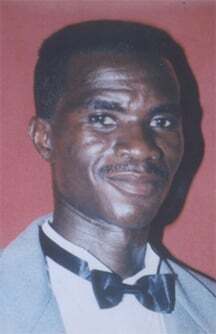 Mario Hastings, Toshao of Kako, Region Seven, however, said that he was surprised that the Chairman had made this statement. “That is not a fair statement. How can he say that? I am a member of the NTC and I am in full support of the protest,” he said.